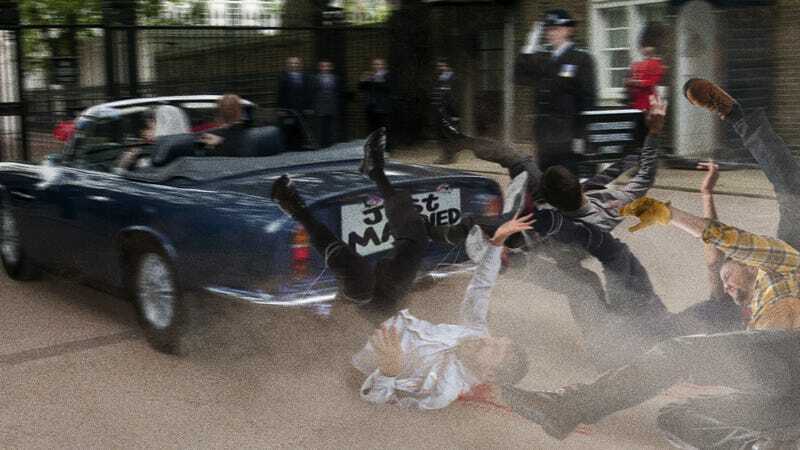 Friends and family are waving after the newly married Prince Harry and Meghan Markle as they drive away from the church with “Just Married” written across the rear window and a dozen commoners festively tied to the bumper being dragged on the ground behind. Queen Elizabeth was seen wiping tears away from her eyes as she pelted the rag-wearing, soot-covered peasants tied to the carriage with rice, proudly bidding wishes of good luck to her grandson and the woman of his dreams. Both newlyweds were seen leaning out the window of the vehicle and blowing kisses back at their loved ones just as they turned a corner, causing several of the commoners tied to the back to get dragged directly into a mailbox before being yanked forward and onward, leaving long streaks of blood on the road. Just ‘royally’ married, indeed!